Performing the most complex and delicate procedures with unmatched precision. At Middlesex Health, we are proud to offer one of the most robust da Vinci® surgical programs in the Northeast. While many healthcare centers provide only prostate and gynecologic robotic surgery, our expert surgeons also perform robotic thoracic (lung), gallbladder, and weight loss surgeries. They have also pioneered a revolutionary new procedure to cure sleep apnea. What is the da Vinci® Surgical Robot? The da Vinci® SI Robot is a complex robotic instrument combined with a high-performance camera vision system. Your surgeon sits at a console to direct the movement of the robotic arms while using the powerful, high-definition camera to clearly visualize the surgical field. Even though it is called a “robot” the da Vinci® Surgical System cannot act on its own. Your surgery is entirely performed by your physician. The robot simply translates the movements of the surgeon's hands into smaller, more precise movements by the robotic arms. 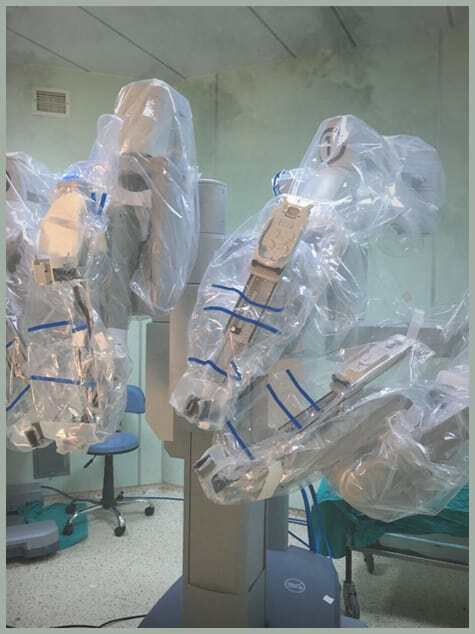 What conditions are treated using da Vinci® Robot-Assisted surgery? What are the benefits of da Vinci® Robot-Assisted surgery? What types of surgery are replaced by robot-assisted surgery?